The rooftop garden, where the chef grows his herbs, is pretty neat. But it's the beehives there, from which they make their own honey, that amaze me! Near the Blackcomb Mountain chairlift, this inspiring château has gorgeous floral arrangements in the impressive lobby and lounge. Upscale rooms, which range in size, feature sumptuous bedding. The grounds are lovely and you can enjoy croquet or giant Jenga and other games. There is a luxurious indoor and outdoor pool area which offers food and beverage service. If you simply must shop, you'll enjoy perusing the luxury stores and art galleries. Smoke free premises. 539 units, some two bedrooms. 12 stories, interior corridors. Accessibility (Call). Hwy 99, 0.6 mi (1 km) e on Lorimer Rd (Upper Village), just s on Blackcomb Way, then just e. 4599 Chateau Blvd V8E 0Z5. 4 restaurants, also, The Grill Room, The Wildflower, see separate listings, full bar, entertainment. coffeemakers, pay movies, high-speed Internet, wireless Internet (fee), safes. sauna, hot tub, steamroom, cabanas, regulation golf, tennis, downhill & cross country skiing, snowboarding, recreation programs, bicycles, lawn sports, trails, health club, in-room exercise equipment, spa. 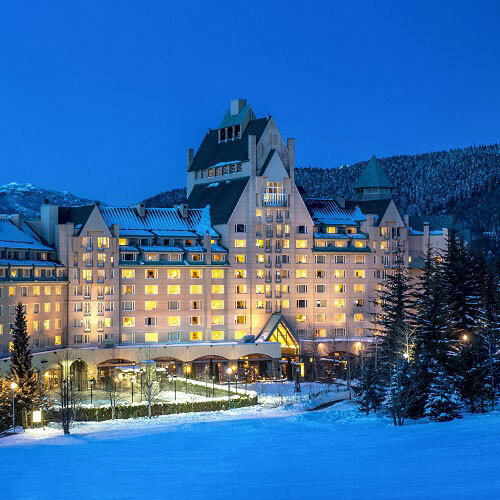 valet laundry, room service, area transportation-Whistler Village & golf course.